With just four months to go until FlyPharma Asia 2019, it’s time to book your place now! So why should you attend? Reasonably, leaving the office for one or two days to attend a conference requires justification and knowledge that you’ll leave the conference having learnt a thing or two. With the early bird special ticket rate set to expire on 30 January, here are four reasons why you should attend FlyPharma Asia 2019. FlyPharma Asia is aimed at forward-thinking individuals and businesses. The conference will provide a discussion on the latest pharma supply chain topics with a platform for industry experts to share their views. Click here to find out more about proposed topics for the conference, or register your interest here to be the first to know who will be presenting and all session details. 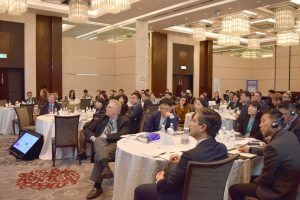 With workshops, panels and a complimentary evening Network Event, FlyPharma Asia will offer an excellent setting to interact and engage with senior and executive pharma and cargo professionals. You’ll be sure to leave with a range of contacts and follow-up prospects. Collaboration and innovation are always core themes at FlyPharma events, and our presentations and panels will show how others have cut costs, created greater efficiency and reached patients faster. After the conference, you will take away the knowledge and new perspectives you need to uncover the potential in your supply chain. Not only will you discover how your colleagues and peers have saved money in their businesses, by taking advantage of our early bird discount, you will receive 30% of your delegate pass! Register here before 30 January 2019 to claim your discount – and buy a two-day pass for just £665 (US$885). All early bird delegates will have access to all sessions on both days of the conference, including refreshments, lunch and access to the evening Networking Event on Day 1. We look forward to seeing you in Hong Kong on 27-28 March 2019!